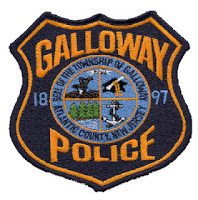 According to Galloway Township Police, on Sunday, March 24, 2013, the Galloway Township Police Department responded to Tailgater’s Sports Bar and Grill in reference to a disturbance that occurred during a fundraising event. On Friday, March 29, 2013 a photograph was brought forward to The Galloway Township Police Department that showed Corey Herold of Egg Harbor City perched on the hood of a Galloway Township Police Vehicle with his hands in the air while giving the camera “The middle finger”. Herold posted the photograph on his “Instagram” account with the caption, “This I do when I get tipsy #copcars #coolkid #yolo”. As a result of Herold’s actions the hood of the police vehicle was damaged. The photograph was taken while police were inside the establishment investigating the initially reported disturbance. Corey Herold, 24 of Egg Harbor City, was arrested and charged with criminal mischief and disorderly conduct. He was released on a summons pending a future court appearance. The investigating Officer is Patrolman Przemyslaw Ryba. March 30th was on the Press Release, verification has been sent to the GTPD. waiting on response. Changed to todays date until verified.